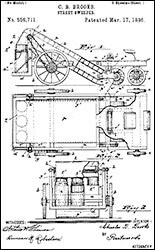 Charles Brooks designed the street sweeper and patented it on March 17, 1896. Prior to his invention, streets were cleaned manually by workers picking up trash by hand or sweeping it with brooms. Brooks’ invention was made of a truck with a series of broom-like brushes attached which pushed trashed and debris off onto the side of the road. The street sweeper initially faced a lot of resentment from workers who felt they could do a better job. Eventually, as cities grew bigger and more and more litter accumulated, the street sweeper became indispensable.